I took these screen caps from my weather.com app on my iPod. 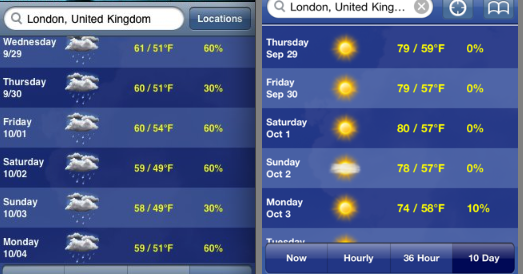 I took the one on the left several days after we moved here to show my friends just how “lovely” London is. I took the one on the right a year later, which was yesterday. I was going to turn this post into a reflection on a year in London, but as I wrote it in my head it didn’t feel right. So maybe that deep reflection will come at a later time, or maybe it won’t (just like those promised posts about dental floss and our Austria/Italy holiday.) 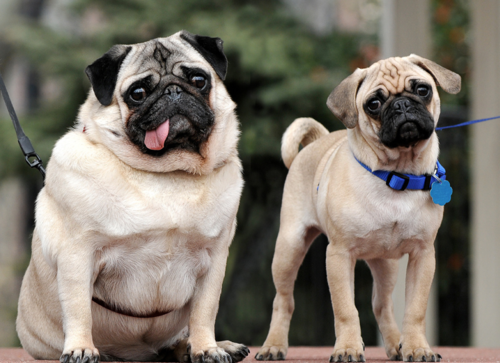 Until then, enjoy this photo of an obese pug standing next to a not-obese pug. 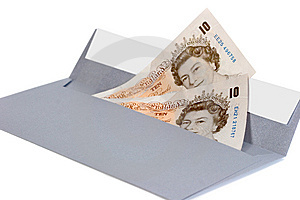 I believe when last I wrote I was promised the money would arrive on Saturday at 9:30 a.m. To no surprise it didn’t. As usual, I called Nick the plumber on Monday and he once again assured me he would bring the money by. And as usual, he did not. I couldn’t believe it. Every time I called, Nick was apologetic — he seemed like a nice bloke. But I find it hard to believe that a person can be that forgetful. Forgetting to come by once or twice? Sure, he’s a busy man. But he told me SIX different times he would show up and didn’t. I finally broke down and called Ted. He too thought the situation was ridiculous. He told me to try calling one last time before he would take control of the situation. So this morning I called my number-1-speed-dial Nick the plumber. Despite all that’s happened, I maintained a polite tone. “Do you think I’ll be able to get my money back today?” I asked him. “Yes…” Nick replied, as if I was asking him the stupidest, most obvious question ever. Like we hadn’t had this conversation five times already. “Do you know when?” I asked, hoping for some clarification. “After the job I’m on,” he said, and apologized again. “I genuinely keep forgetting,” he said, “I wasn’t macking you about.” — At least that’s what I thought he said. I had to google “macking you about” to see if it’s an actual British saying, because I always thought macking meant kissing. Apparently the Internet does too. That was 10 a.m. when I spoke to him. By 1 p.m. — three hours later — I still had no money. Surprise, surprise. So I called Ted again and told him about our conversation. “OK. Leave it to me,” he said, with “business” in his voice. I’m still perplexed by the situation and am tempted to generalize. Is it British people that are so forgetful, disorganized and unmotivated? Ted is the epitome of Britishness and he thought the situation was absurd. Is it plumbers? I know plumbers in the US are known for being late and overcharging. Or is it just this Nick chap, who happens to be a British plumber, but is the exception, not the norm? 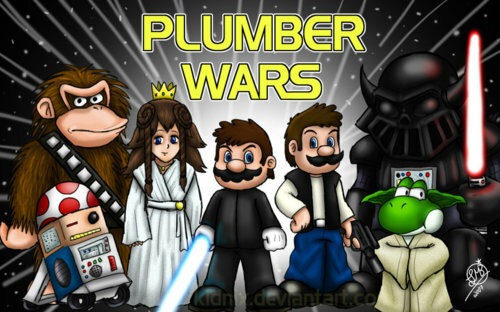 I’m just glad Plumber Wars are over and I can resume my normal blogging. So it’s Monday and something doesn’t feel right — no, I’m not having “a case of the Mondays.” My schedule feels out of whack because I didn’t go to Sainsbury’s. Every Monday I always drag my trolley over a mile to go grocery shopping. Today I didn’t, but I still got my groceries. That’s right, friends, I caved and tried online delivery. And I’m afraid I may be hooked. I’ve been considering grocery delivery ever since I almost broke my arm and back carrying my groceries back almost a year ago, but I hesitated because I’m a cheapo and don’t like the words “delivery fee.” My weekly pilgrimage to Sainsbury’s was also good exercise, and lately I’ve been listening to my Teach Yourself Chinese lessons as I walk (yes, I’m the crazy girl pulling a shopping trolley, muttering “Thank you, but I don’t drink alcohol,” to herself in bad Chinese.) But last week I received a £10 off £50 online order voucher with my receipt at the store. And my love of coupons overpowers my hatred of shipping/delivery fees. And lately my local store has been out of some of my usuals… and the forecast said rain on Monday, my shopping day… so on Saturday I started adding items to my virtual cart. It was surprisingly easy. The only downside was they were out of some of things I was really looking forward to, like frozen mango for my smoothies. My store doesn’t stock it and I was happy to see it online, but maybe it’s being phased out because normal people start drinking tea and hot cider when fall hits, not smoothies. (My addiction to my new blender and smoothies is material for a different post). I managed to get my cart (I’m sorry, “trolley”) to almost exactly £50, stocking up on heavy things like bottled flavoured water and a giant pack of toilet paper. I was pleasantly surprised when they said delivery on Monday would only cost £3.50 — I was under the impression delivery cost at least £6 and you had to order more than two days in advance. Kudos, Sainsbury’s! So I got a week’s worth of groceries plus some stock up stuff for £43.50. Now I just had to wait for it. As you probably inferred from my plumber posts, I don’t like waiting for people. I booked a delivery slot of noon to 1 p.m. and started getting antsy at 12:45 p.m. when my groceries weren’t here. But just as I was googling “Sainsburys grocery delivery late” to see if late groceries meant free delivery, my doorbell rang. The friendly driver placed my groceries neon orange bag-by-neon orange bag in my front hallway. He didn’t deliver them to my kitchen like some stores do, but I was OK with that. He jokingly tried to throw my 18-pack of TP at me, then had me sign for my food. And that was that. I had my groceries without the epic journey. I checked each item off my receipt as I put it away and was pleased at the far-off expiration dates on the produce. That was my other concern about not picking out my own groceries. I’m a stickler for expiration dates. Even if I’m buying something I plan to eat that night, I will still rummage in the back of the display to get the item that expires latest. When I was in college I took an advertising class where our main project was to create an advertising campaign for Peapod’s relaunch of its online delivery grocery service in Milwaukee. We spent class after class going over the pros and cons of online grocery shopping. The main con was the delivery fee (which is $7 to $10 for Peapod. Sainsbury’s cost me £3.50, which at the current awesome rate of £1 = $1.54, is $5.42. And I got £10 ($15.49) off! ), followed by expiration dates and not being able to select your own produce. We tried to counter that by saying only one person at the giant Peapod warehouse selects your produce, instead of at the store where your fruit is manhandled by dozens of shoppers before it gets to your cart. The struggle with launching in Milwaukee is that everyone has a car there — delivery grocery service is best in cities like New York, Chicago and London where a lot of people don’t have cars (and choose flats that are over a mile away from the store and it rains all winter long). 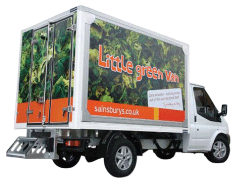 Delivery groceries are definitely wildly popular in London. Instead of just one company like Peapod, every major grocery store offers its own delivery service. (If they all have £10 off coupons, I may try them all!) I will probably still make the hike to Sainsbury’s occasionally to get the things that cost more or are sold out online, but I think I can say I’ve finally joined everyone else in my neighborhood in the delivery grocery revolution. I woke up this morning feeling like I did yesterday — “Yeah! I’m getting my money back today! Soon this whole thing will be over!” And, just like yesterday, I sat in anticipation of the door bell or the mail slot, while McDonald’s morning time, then noon slipped by. At 1:45 I called Nick the plumber. “I’m in the middle of something, I’ll call you right back, I have your number in my phone,” he said. So I sat by the phone. Soon it was 2 p.m. and I hadn’t eaten yet, so I took my phone into the kitchen and made lunch. Then I watched an entire episode of The Vampire Diaries while eating lunch. Still no phone call. What are the etiquette rules of “I’ll call you back in a minute” and an hour passes? I let it go until 3:30 and then I called again. “Oh, I’m right around the corner, I’ll be there within the hour! See you soon!” a rather chipper Nick the plumber replied. Once again the “Yeah! I’m getting my money back!” excitement returned. And then an hour passed. Then two hours. I was getting antsy — I wanted to do my workout video and take a shower. At 5:45 I said screw it and did my workout anyway. Then at 7 p.m. the doorbell rang while I was in the middle of curling my hair. “Finally!” I said out loud and rushed to answer it. It was Stephen, coming home from work early. At this point I was coming up with all kinds of crazy scenarios for why Nick had not come by or called. Was there a plumbing emergency in Parliament and all London plumbers were required to help (and turn off their phones?) Did Nick get into a car accident on his way around the corner? I hoped not. I also worried that he had slipped an envelope of cash into the wrong mail slot, making one of my neighbors very happy. Was this guy’s sense of timing so skewed that he thinks 7 p.m. is in the morning and “within the hour” means over three hours? I decided to stop speculating and called once again. I decided to be nice to him and said tomorrow would be OK — he even told me it’d be around 9:30 a.m. (which in Nick the plumber time probably means 1:30 p.m.) I asked him how much money I was going to get, since I didn’t want to get my hopes up and then see a tenner float through the mail slot. He told me he still had to “sort it out.” Which made me think he had no intention of coming today, and that “I’m just around the corner!” business was a bunch of blarney. Yes, this is what real life in London is like, kids — hanging around the flat waiting on a bloke to bring you a yet-to-be-determined amount of quid that was actually yours to begin with. It’s not all rides on the Eye and high tea with the queen. I woke up this morning feeling happy — the sun was shining, and I was finally going to get my money back from the plumber. It was going to be a glorious day! But then I remembered — this is the UK, and things aren’t easy like that. I called the plumber yesterday and he said he would bring my money over “Tomorrow morning,” which would be this morning. I didn’t win the argument with Ted, so I was only going to get a portion of my money back, but I’ll take that. I can usually make a convincing argument through email or even voicemail, but I’m not the cussing-out, yell-til-I-get-my-way type. Plus, this was an argument that was hard to win — we have been living here almost a year, and it was my food that blocked the pipe. Ted did agree to pay to fix the disposal and for the pipe part that the plumber bought. When I was discussing this whole ridiculous situation with Stephen I asked him about just taking the money out of the rent. He reminded me something that slipped my mind — we put down a hefty deposit on this place. So much for the “So what, what are they going to do?” attitude. But it also reminded me of something else — I really need to clean this place up, or we’re going to lose a lot more than £130. You see, I’m not really the best cleaner. My mom is an avid cleaner — she has a weekly schedule and sticks with it. I told myself I was going to do that in this new flat. But the problem I have with regular cleaning is that it’s not satisfying — the best part of cleaning is seeing how much nicer everything looks and rediscovering the object’s original color. You don’t get that when you clean the bathroom every week. So, unfortunately, I sometimes let the bathroom get a little grimy before I break down and clean it. It also doesn’t help that all of our bathrooms are marble — ceiling to floor marble, which is impossible to clean. The en-suite bathroom is the worst. Not only is the entire counter marble, but the faucet (I’m sorry “tap”) is such that you have to twist both temperature nozzles with your wet hands, ensuring you get water all over the counter each time. And for whatever reason, nothing in that bathrooms ever dries — not the towels, the floor mat or the counter, which means the standing water starts to turn the marble yellow. It’s disgusting. So today I decided to pretend that we were moving out and tried to restore the bathroom to a state that would give us our deposit back. While at the grocery store this week I picked up a bottle of Bar Keepers Friend — “the original and best stain remover and multi-surface cleaner.” The bottle told me it was OK to use on marble, even though googling it told me it wasn’t. At this point I decided the marble was already shot, so I couldn’t do much worse. I have no idea what that button does. There are "jets" in the tub, but I don't think they work. They just create nasty stains. Seriously, gold fixtures and marble? Whoever designed this bathroom never thought about cleaning it. After all that cleaning I was spent, but I was also on a roll. I went into the kitchen to empty my nasty water bucket, but ended up cleaning the stovetop and the sink. I was about to clean the kitchen floor when I decided I’d much rather eat cereal out of the box and watch The Inbetweeners. I’m glad the bathroom and part of the kitchen are clean, and I’ll promise to bring you out more often, Bar Keepers Friend. The other day I was on CNN.com attempting to brush up on current events. So naturally I clicked on a partner link to “What causes vivid dreams?” instead of learning about Libya or Syria. That’s because I have very vivid dreams almost every night. Most of them are good — I sometimes get excited to sleep so that I can dream (which makes me sound like Hamlet). I don’t have night terrors or wake up in a cold sweat or screaming or anything. In fact, my few nightmares almost always seem to be about plane crashes, which was especially disturbing when I was flying everywhere back in August. Anyway, I clicked on this article hoping it might give me some insight. Instead, it made me feel like a hypochondriac. 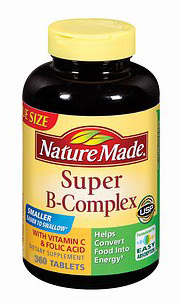 I’ve been taking B-complex vitamins for around 10 years now I think. When I was young I used to get horrible stomach aches all the time. My family thought it was stress (I was a very stressed second grader. Seriously.) I used to get so nervous that I would get a stomach ache at an event like a family wedding that I would end up giving myself one. My aunt recommended my mom give me B vitamins. I don’t know what about B vitamins makes kids not have stress-induced stomach aches, but they seemed to work. (Thanks, placebo effect). So everyday throughout high school, college and beyond, I’ve taken a B vitamin. I recently also started taking a women’s multi-vitamin because my urine wasn’t Mountain Dew-yellow enough (too graphic?) People argue the pros and cons of vitamins and supplements daily. It seems to me they only do you more harm than good when you take fistfulls every day. I only take two. But the minute I read that article, I was convinced every pain I’ve ever felt in my body was because of my complex neurological disorder caused by my bloomin’ vitamins. I started googling “vitamin B6 toxicity,” which told me I’m going to lose the feeling in my arms permanently if I keep taking my vitamins. But of course I can’t stop taking my vitamins. For the placebo effect to work, you actually have to take the pill. So instead I decided I should be sensible and compare the overdose amount with the amount of B6 vitamins I’m actually consuming. According to my research, the recommended daily dosage is around 2 mg. The maximum intake without losing an arm is 100 mg. “It is actually fairly easy to exceed the maximum dosage, as many supplements contain 100 mg (or more) of vitamin B6,” one website told me. I used to joke about how the back of my vitamin bottle told me I was getting 1,000% of my daily amount for certain minerals. Now it was going to kill me. So I ran into the kitchen and found my vitamin bottles, fully expecting to see “150 mg vitamin B6” on the back. Instead I saw 5 mg on my super B-complex vitamins and 2 mg on my multi. So I’m getting 7 mg a day — far from 100. Suddenly my arm didn’t feel like it was twitching anymore. If my vitamins aren’t killing me and the only side effects are vivid dreams and yellow pee (sorry), I think I’ll keep taking them.